Originally used as a large warehouse for a major retail store, this older building had fallen into disrepair from a lack of maintenance. Wishing to contribute to the neighborhood’s improving image and prompted by the need to repair and modernize the building, the building’s owners asked TFA to develop a repair and modernization design within a limited budget. TFA developed plans for the repairs and also designed facade improvements that could be economically implemented. 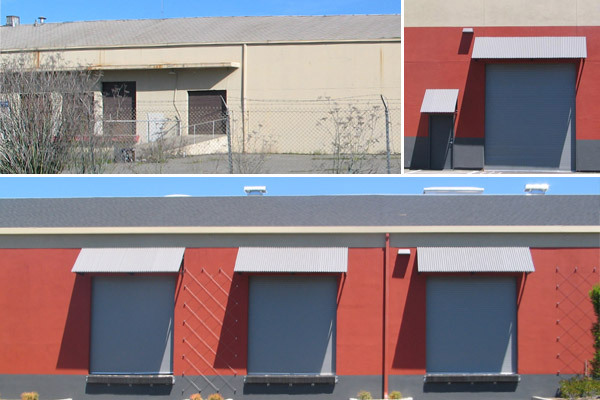 By creating new steel awnings at the loading docks, painting the exterior, upgrading exterior lighting and adding wall mounted cabling for landscape vines to grow onto, TFA met these budgetary and aesthetic objectives.